-Three piece mahogany body with a center seam joining the two main pieces together along with a small third "uh-oh the two halves are slightly too small" piece in the lower right of the body. Late sixties style shallow beveling. -Seemingly one piece mahogany neck with rosewood fretboard and medium jumbo frets, no fret nibs and a volute at the back of the headstock, which angle seems to be 14 degrees. Nut width is about 40mm/1.5748 inches and the profile is pretty slim. Full Gibson-style crown inlay on headstock and Gibson style wide bevel bell TRC, not sure if original. It's joined to the body with a '66 style neck heel and a short tenon. -Standard MiJ metric ToM bridge and tailpiece, eg. M4 bridge posts drilled straight into body. -Standard SG-style control layout, original knobs were early sixties top hat style but I switched them for witch hats. Electronics cavity is the larger type but not fully rounded like on actual late sixties Gibson as well as usual Burny copies. -Large "batwing" pickguard with two humbuckers. Pickup routing is like for a small pickguard though. -Tuners have been replaced by Grovers at some point, not sure if originally was for 10mm tuners. On paper looks like a RSG-75 '69 or the Angus Young AY model from the 80's, but the 70's style features like the volute and small neck are unlike those models judging from Burny's catalogs. 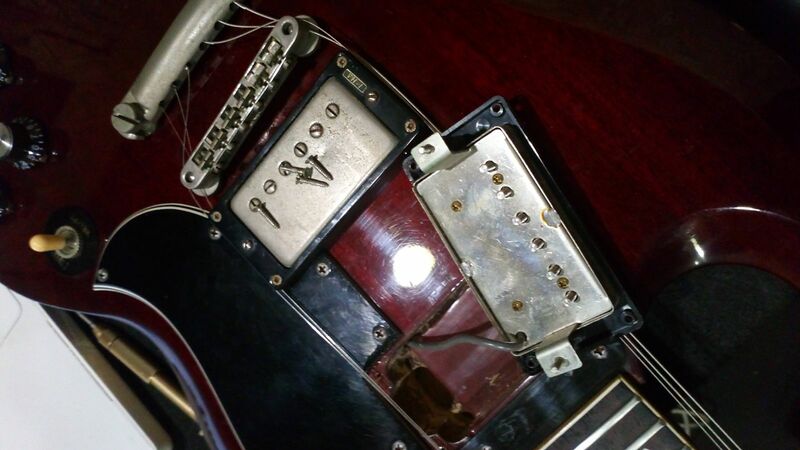 For other identifying features, the bridge and tailpiece both read SG BRIDGE/TAILPIECE MADE IN JAPAN under them. Neck pickup has no markins so hard to say is it a VH1, can't measure DCR at the moment. Bridge has been replaced by a '57 Classic Plus at some point. There's a small number in the neck pocket that reads 70911 along with a possible incomprehensible final character. There are no other serial numbers on the guitar. Yeah it's an '87 RSG-75. ('69 model) nice axe. Angus Young model had a white poker chip. Serial number starting with "7" is the tell for 1987. How do you like the burny SG? I have a 78' Burny FLC-85BL Les Paul Custom. I love this guitar. It is one of my favorite ones. Blows any Gibson Custom away. I had a late 90's Gibson SG years ago. It was okay but not great. I know Burny had their stuff made from all different companys. Tokai in the late 70's and so on. I heard Tokai made some of their guitars but not all of them in the late 70's. Not sure who made mine. No serial number on the back of the head stock on mine. Anyways, how do you like the Burny SG? Anyone know what are the good years to get and the bad years etc? Anyone know what are the good years to get and the bad years etc? The great years were when they came with the VH-1 pickups. 83 - 86 I believe. Thanks for the replies, '87 sounds about right and Google would agree with it as well. As such the neck PU is probably a VH-3 then. Maybe will have to source a VH-3 bridge as well. I think this one was made by Matsumoku or Dyna instead of Tokai, but hard to say for sure. So, basically any model with the VH-1 PUs is good? Like this one? The routing on the op's SG is not Tokai. As for the reverb link SG it's hard to know if those are the original pups, etc.... The fact that the seller can't count how many frets the guitar has doesn't inspire confidence. How to you tell the routing is Tokai? 24 frets I did not even see that. Pretty funny. On either side of the routing, you'll see the deep indentations - Tokai routing, they are square shaped, while the routing in your link shows them as oval. I see what you are saying about the routing square vs oval. I just pulled apart my Burny Les Paul (which I love) it is has oval routing. 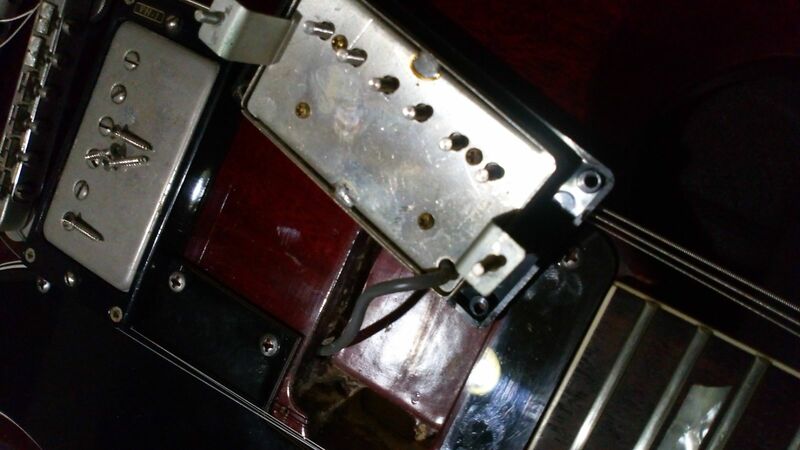 I pulled one of my Tokai LS-80s from 81' to have a look and it is square just like the pic you posted. Here are a few more pics from the Reverb listing showing what the seller says is the VH-1 PUs. From the below pics notice the oval routing (non-Tokai). Not sure if this matters though. I love my 78' Burny LP with is not a Tokai made one and it is one of my favorites even over my two 81' LS-80s. By the way the seller just told me it was 78' when I bought it. I have no way to prove it no SN. Which seems to check out on the internet for late 70s. Though it seems older that my 81' Tokais to me. So, 78' sound reasonable. Can you be sure this guitar has the original pickups? 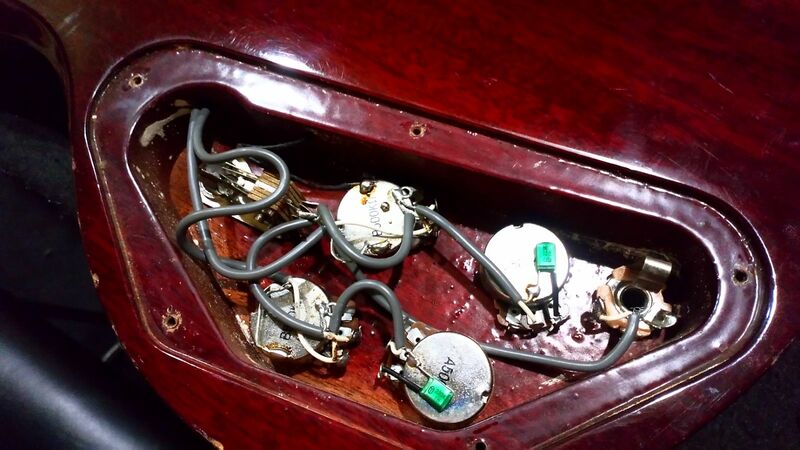 I think guitar has the original pickups. Factory wiring. These pickups correspond to the images of vh1 of that period on the internet. I didn't mean to say that since it didn't have Tokai routing that it wasn't a good guitar, i just was pointing out that it wasn't a Tokai made guitar. If the pots are original to the guitar you can date a guitar within a year or so by the pot numbers on non serial number guitars. Wish i could help more. Do you know how to date the guitar from the pots? I know a lot or enough about Tokais. At least their LS series from 70' and 80's. I really do not know anything about Burnys. About stuff like this and what the good one to get are and the bad ones. The guitar I posted pics of above is for sale right now. If it was good I may make an offer on it. It is listed as Burny RSG-75 80's model and nothing more. Though I cannot prove or look up any of this. I do not know if the VH-1 PU are actually VH-1 as there is only a sticker on the PU covers and not the PU themselves. Though I can see used VH-1 PU for less than $100 USD so either way they are cheep to buy later. I guess I care more about the wood and if it is really a good Burny and really a RSG75 and not a Chinese knock off. I know there are a lot of people trying to knock off Chinese made Tokais as MIJ LS-80 or so. That is why I learned to much about them a few years ago before I bought a few of them. Dating MIJ guitars from pots is probably a lost cause, I've never seen any asian made guitar use any sort of pot codes on their pots. However the guitar on sale on that Reverb ad is 100% MIJ, not a chinese Burny. You could try to ask the seller about the pickups, eg. have they been replaced. Better yet, ask for pictures. Those are pictures of the PU in my post 4 above. The seller sent them to me. He said he thinks they are original but that does not mean anything. I think he is a dealer.